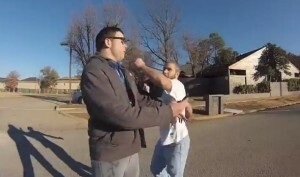 NORMAN, Okla. — A video uploaded last week by the Abolitionist Society of Oklahoma shows a post-abortive father shoving and punching a sidewalk counselor before pursuing another man holding a camera in order to destroy evidence of the attack. The incident occurred last Tuesday as Society director Toby Harmon and his friend Jeremy Brown were seeking to provide alternatives to abortion-minded mothers at Larry Burns’ Abortion Surgery Center in Norman, Oklahoma. As they stood holding signs on the sidewalk, the men saw a couple exiting the facility and attempted to offer help. When the woman replied in the negative, Harmon again extended the offer. And that’s when the man accompanying the woman became physically aggressive. The man, described as being in his early twenties and wearing a white t-shirt and jeans, then confronted Brown, who held out his arm to keep the man at a distance. However, the man then pushed Harmon, and seconds later, punched him in the face. “There’s forgiveness in Christ,” Brown stated in response. However, when Harmon advised that he had captured the assault on camera, the man then began following him down the street. Harmon instructed Brown to call the police. As Brown phoned 911, the man continued pursuing Harmon, pushing him, grabbing his possessions and stomping on his camera. “You ain’t about to have kids when I’m done with you, boy,” the man threatened. As Harmon had a backup camera, he continued recording as the man angrily roughed him up and spit upon him. “Did you just threaten my life?” Harmon asked. “Yeah, I did,” the man replied. Brown and Harmon later pressed charges against their attacker. Police have characterized the incident as “assault and battery,” and criminal “vandalism.” Harmon said that the men never defended themselves when assaulted. Harmon is now requesting prayer for the man that attacked them last Tuesday.